Solis Audio, a brand under the Spectra umbrella (alongside Studebaker and Hello Kitty, you’ll be happy to learn), hasn’t been around long, but the company has produced some very interesting audio equipment in its short existence. 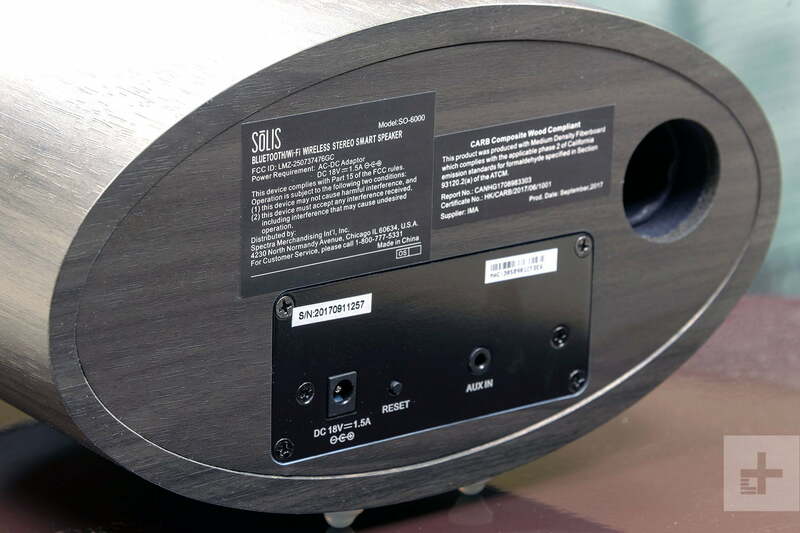 Apart from two sub-$1,000 vacuum tube amplifiers, Solis’ catalog consists solely of the SO series, comprising the SO-3000, the SO-6000, and the SO-7000, all of which boast unique, retro form factors and built-in Chromecast. We had high hopes for the visually striking SO-6000, but in the end, we found ourselves wishing this retro-styled speaker would go back to the ‘50s and stay there. 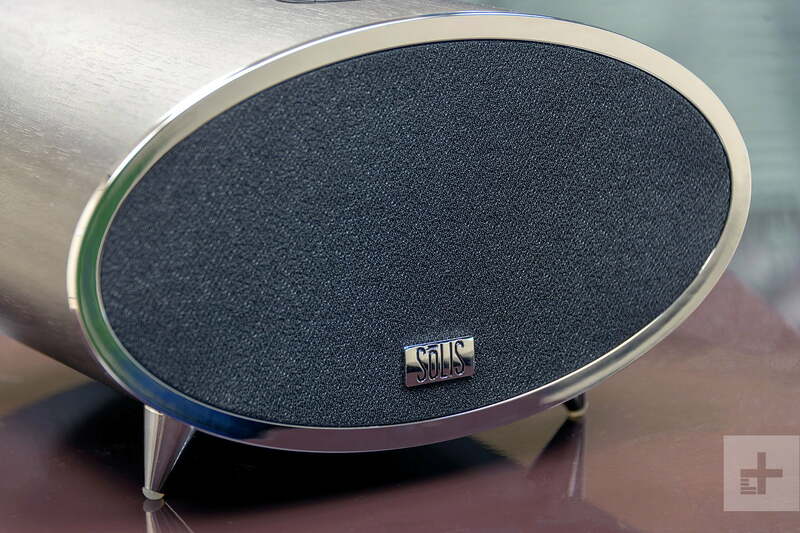 The SO-6000’s packaging doesn’t quite reflect the speaker’s distinctive, mid-century modern aesthetic. Apart from a green roof with bowling ball-esque marbled finish, the box itself is mostly gray, slathered generously with information about Solis and the SO-6000. Interestingly, the box does feature a logo which says “Hi-RES Audio,” but it’s not the official “Hi-Res” logo (see here) licensed from the Japan Audio Society, which only goes on equipment which has been tested to pass certain criteria, including reproducing frequencies above 40kHz. In this case, we’re not sure what “Hi-Res” refers to; it’s possible Solis didn’t want to go through the certification process, or that this version requires different criteria from the well-regarded Japanese standard. Inside the box, the SO-6000 is buffered by gray foam and accompanied by a smaller cardboard box. This box turned out to have a power cable (in another, smaller box, of course), a user manual, and an auxiliary cable in it. As previously stated, the SO-6000 features a very unique look. It’s cylindrical, with oval-shaped ends rather than circular, and it’s oriented sideways so that the speaker’s grille is at one end and the ports are on the other. On the bottom are pointy silver feet (in the front) and little rubber grips (in the back) to prevent slippage. We lamented the lack of a dedicated mode switching button for Bluetooth playback. The front grille is encircled (en-ovaled?) by a strip of fingerprint-friendly chrome plastic, which stands out against the dark wooden enclosure. 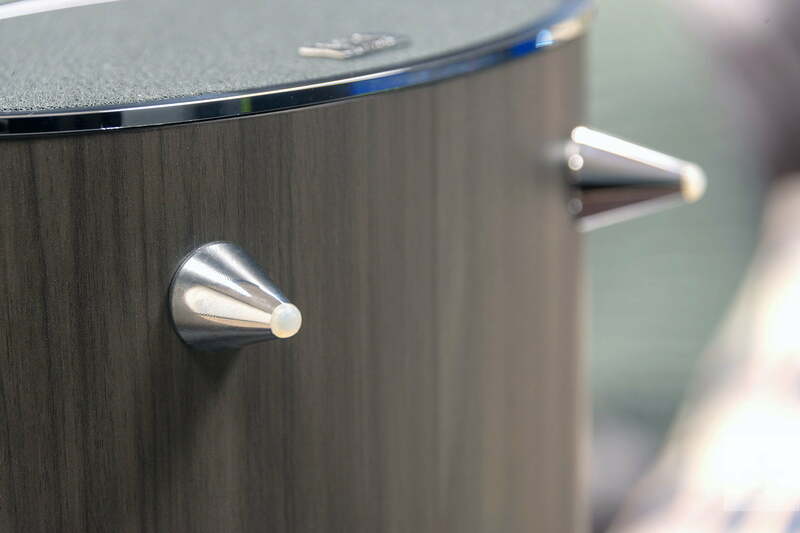 The finish is smooth, with a bass port in the rear alongside a metal panel featuring ports for auxiliary and power input and a physical reset button. 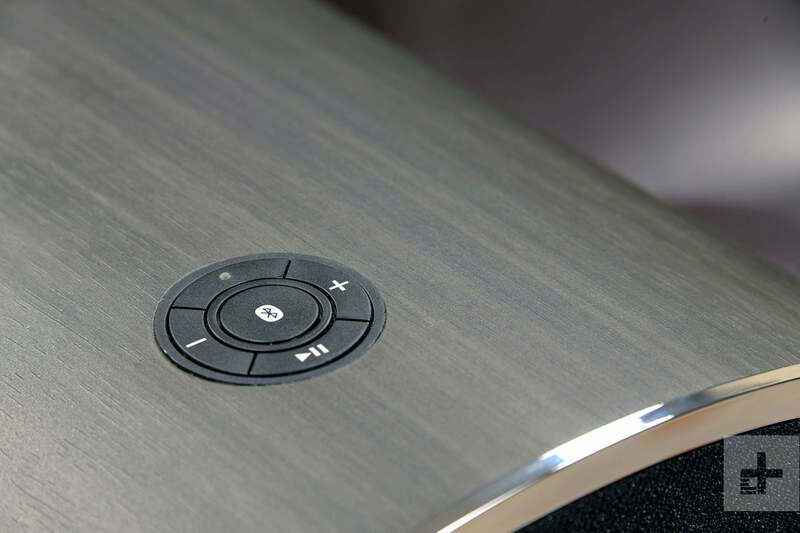 Atop the speaker is a five-button control array, which has buttons for volume, play/pause, Bluetooth pairing, and one button that’s actually just an LED indicator (it does press in, but it doesn’t do anything as far as we can tell). The array is designed neatly, but it’s actually misaligned with the front of the speaker, giving it a poorly crafted feel. In general, the speaker’s build quality could be better. One of the rubber foot grips fell out mere minutes after removing the speaker from its packaging, and the bass port is hewn roughly, as you can see parts peeling inside the port. The SO-6000 features built-in Chromecast Audio which (like AirPlay) allows you to stream audio over Wi-Fi through a variety of streaming apps, including Spotify, Pandora, Tidal, and Google Play Music (which we used primarily). You can also sync it up with compatible speakers via the Google Home app, and if you have a Google Home speaker, you can control the SO-6000 by voice, though it doesn’t have a mic of its own. The speaker doesn’t have a battery, so it’ll need to stay plugged into an outlet. The provided power cable was a little short for our taste, though. Something to note: Curiously, the $270 SO-6000 boasts the exact same interior specifications – dual 3-inch stereo speakers, 18W power output – as the $200 SO-3000. The SO-3000 is a little less showy, but otherwise we’re unsure where the difference lies. The SO-6000 automatically updates when first powered on (there’s no power button, so it’ll turn on when plugged in), which takes around 5 or 10 minutes, indicated by the LED on top pulsing orange. Once finished, it automatically enters standby mode (solid red). Songs with substantial bass quickly became overwhelming and boom-y. From there, you first must set the speaker up over Wi-Fi, which requires the Google Home app. Open the app, choose the speaker from the main menu, and follow instructions until the light on top turns green. That means it’s in casting mode, ready to play. We did lament the speaker’s lack of a dedicated mode switching button, as toggling to Bluetooth mode was confusing and annoying. The manual says tapping the Bluetooth button once will put it in pairing mode, but according to a chart in the manual, ours went into “Bluetooth mode disconnected” instead. We didn’t know what that meant (several sections of the manual are typo-heavy and difficult to read), and fiddled with it for a few minutes before the light suddenly turned blue and the speaker appeared in our Bluetooth device pairing menu. Once we got the SO-6000 playing, sound was … passable. Overall, the speaker produces a warm sound signature, which is fairly well balanced, but it seems to create an unusual amount of reverberation. That reverberation tends to muddy detail in more detailed compositions like Daft Punk’s Random Access Memories. Songs with noteworthy basslines – Frank Ocean’s Sweet Life, for instance – quickly became overwhelming and boom-y, even at middling volumes, making individual bass notes impossible to discern. Electronic and hip-hop tracks didn’t fare much better, as the SO-6000 just couldn’t manage the balance of an 808 drum beat with other synthetic instrumentation. Cranking it up nearly always resulted in nasty distortion or imbalance. Acts like Dean Martin smoothly transported us to leather couches in a hazy, imaginary lounge. We did, perhaps unsurprisingly, find that music which fit the speaker’s look – like Dean Martin’s Volare and Tony Martin’s Lone Star – sounded great, smoothly transporting us to leather couches in a hazy, imaginary lounge. A few notes here: First, the volume buttons on the speaker are frustrating to operate. Tap once, and you won’t notice a difference, but hold one down, and the volume will shoot way up or way down. Second, we noticed some lag when trying to adjust volume manually. With a locked phone, volume adjustments didn’t seem to take effect until unlocking, and even then, playback tended to stutter or stop entirely on its own. We can’t say whether this is an issue with the speaker itself, the Google Play Music app, or Chromecast Audio, but we haven’t experienced the issue with other hardware. In the user manual, Spectra offers a 90-day limited warranty covering defects in materials and factory workmanship. On the Solis website, it says U.S. customers get a full year. The SO-6000 could fit a niche – namely, in the den of someone who likes throwback design and old-school tunes – but even then, poor build quality and control issues sink its potential before it leaves the dock. Even if you really liked the SO-6000, you’d be better off buying the SO-3000, which offers the same specs at a lower price, and is more well regarded in review circles. Yes! If you’re really into the throwback looks, try Klipsch’s oddly-named The One or the pricier Marshall Stanmore Multi-room, a newer version of the excellent Stanmore Bluetooth speaker with Wi-Fi playback built in. For built-in Chromecast and stellar performance, check out the Riva Arena. The SO-6000’s build quality is not great (as mentioned), but, given its sedentary nature, it probably won’t need to withstand much wear and tear. Chromecast Audio is only going to get better, so we aren’t taking many marks off here. Not unless you really, really love the look. Even then, probably not.